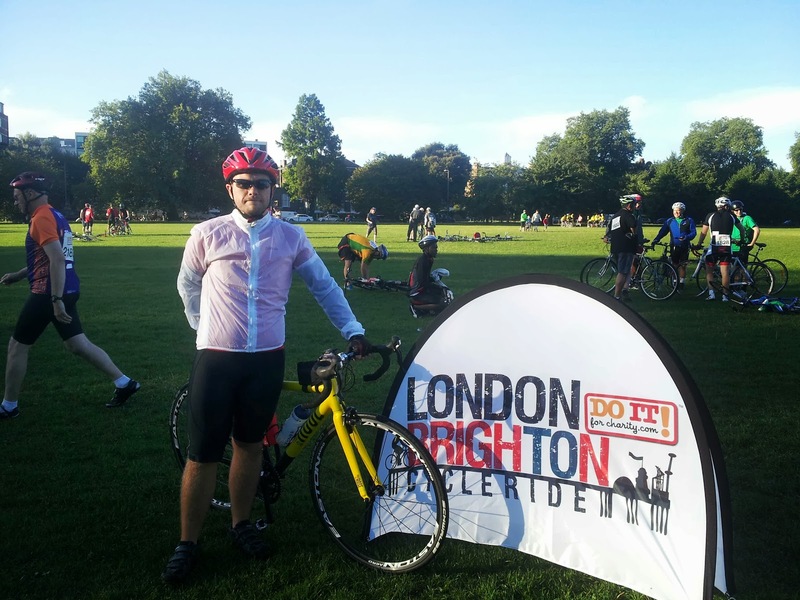 I recently took part in the London to Brighton charity cycle. I was offered sponsorship from Thistle Brighton Hotel to take part in the event and raise money for my charity, the British Heart Foundation. Although you can start the ride anytime between 6-9am I didn't want to start the ride too early for two reasons. Firstly, I didn't want to get up earlier than 5am and secondly, I knew I could finish the ride within a pretty good time and needed to allow enough time for my wife to meet me in Brighton. My day started by getting up at 5am and leaving the house by 5.30am. I drove to an NCP car park as near to the start at Clapham Common as I could. I wanted to make sure the car was secure as I wasn't picking it back up until the following day. I arrived at the car park at 7.30am. I eat my breakfast and unpacked my bike and stuff from the car. It was freezing! The forecast was for a warm, mainly dry day but I put my arm warmers and my new Dare 2B lucid rainshell on just to keep warm. I'm so glad I took it. The ride over to the Common was nice and easy. I'd plotted the route on my Garmin as to not get lost. Once there I used the toilet and registered to start the ride. Registration is easy, you just tear the bottom slip off your rider number and hand it in. I then wandered over to the start where they were letting riders go in batches. I started dead on 8am. 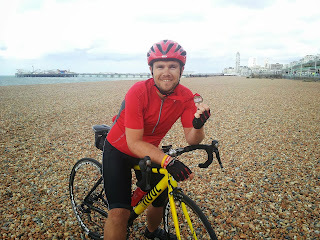 Although not as big as the official BHF London to Brighton, and without road closures and marshalls in abundance, the route was quiet and well signed. Having started two hours after the event had got underway there were many cyclists along the route and knowing which way the route changed up ahead was easy to see. From the start, the route follows a different course to what I've ridden before. However it wasn't long before I was on familiar roads again. Being a seasoned rider and a veteran of the London to Brighton my aim was to try and finish the ride faster than before. On the annual June ride, almost 30,000 riders take part and congestion often slows you down. Also riding as a group you have to ride at the pace of the slower riders. This time I was on my own. My target was 3h30m. As the ride progressed out of London and into Surrey my average speed was staying high. I was confident that I wouldn't need to stop and that my target time was achievable. Heading into Sussex I arrived at Turners Hill. I saw all the riders heading off course and following the signs I ended up at the lunch stop. Not needing to stop, I turned around and carried on. Coming up, was Ditchling beacon. Once you leave Haywards Heath, you can see the Beacon in the distance. As you get closer to the foot of it, it gets bigger and bigger. I have no issues riding up it but it's still a tough hill. It's still a challenge. My legs were feeling tired at this stage though as I'd pushed quite hard up until this point. As you ride up the Beacon you can guarantee that someone will be walking up it with their bike. Not so many this time though. When I go to the top I had no plans on stopping but I did admire the views as I headed towards Brighton. Exposed on the top of the Beacon there was a noticeable strong wind that was coming from the south west. It was also very cool. As I rode along the main road into Brighton city centre the wind was coming straight at me. I did wonder at this point if the course had changed as I saw no riders in front or behind me since I was at the top of the Beacon! Once I arrived at Brighton Pier there was a long run down Madeira Drive to the finish. This time the wind was behind me. As I neared the finish I saw my wife waving to me. I passed her and crossed the finish where I collected my medal. I finished the ride with a personal best time of 3h18m. According to my Garmin, I only stopped for a total of 4 mins! 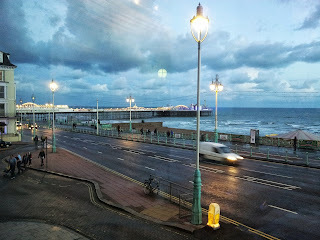 Reasonably tired and reasonably pleased with myself, I headed along Brighton seafront to the Thistle Brighton Hotel. Arriving there at 12pm, I was 2 hours early for check in. Only expecting to be able to leave my bag and bike there, I was told my room was ready and I could check in immediately. I handed my bike to the concierge and then headed to my room. I had a nice hot and powerful shower before getting changed and heading out with my wife for lunch. 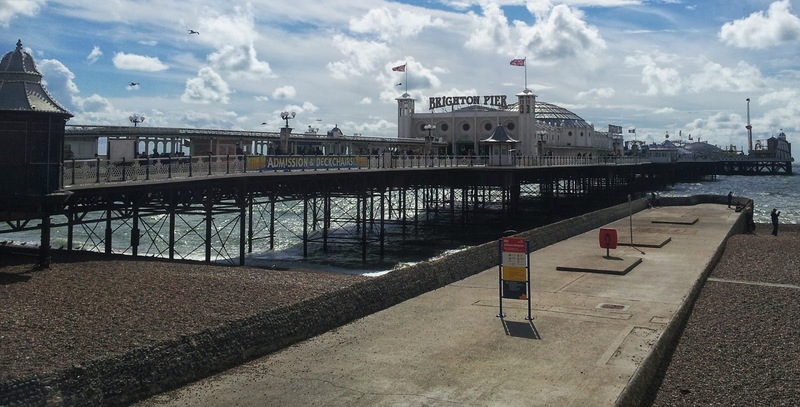 We headed down Brighton's famous Lanes, looking for somewhere to eat. There was so much choice but I was looking for something not too heavy and high in protein. We ended up in Nando's. Job done. We did some shopping around town and then headed back to the hotel. The hotel break was our little getaway for our wedding anniversary and as we had no kids were wanted to make the most of our stay. We grabbed our swimming stuff from our room and headed for the hotel's swimming pool. The pool was lovely and warm and great for relaxing my tired legs. After that we used the steam room and although we didn't use it, there was a sauna too. The hotel gym was also tempting me to have a go but I thought better of it. We then headed for the hotel's large atrium lounge to enjoy a coffee, to help me stay awake. Now being totally relaxed and re-energised we headed back to our room to get changed for dinner. 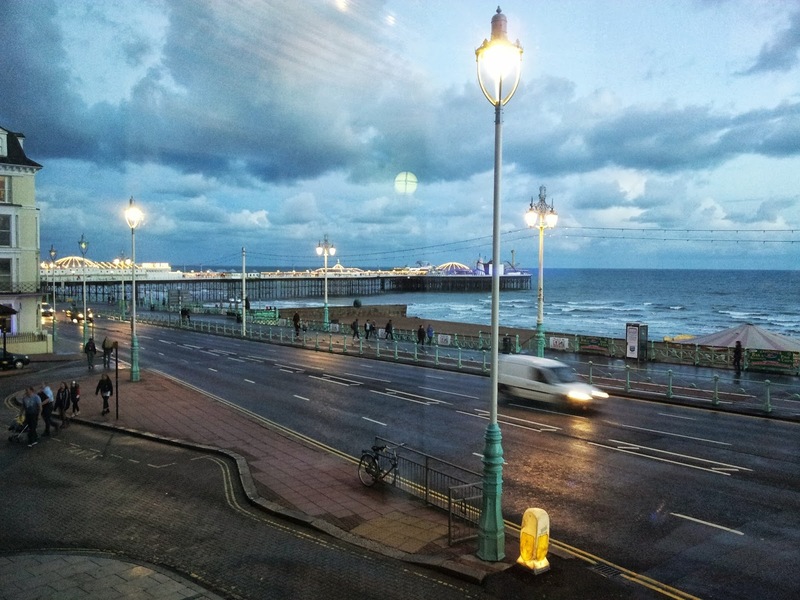 The restaurant is glass fronted and faces the sea so you get a beautiful view of the pier. With dinner included in our stay we had a choice from a lovely three course menu. The food was delicious, and the service was excellent. After dinner we headed to our room to get a jacket so we could walk along the seafront and enjoy the evening. Just then it started to pour with rain. Unsure what to do, we waited a little while and the rain stopped. We still had enough time to walk along to the pier and the Brighton Eye. I couldn't resist taking my wife on the Eye and we enjoyed the night lights of Brighton from 150ft up. 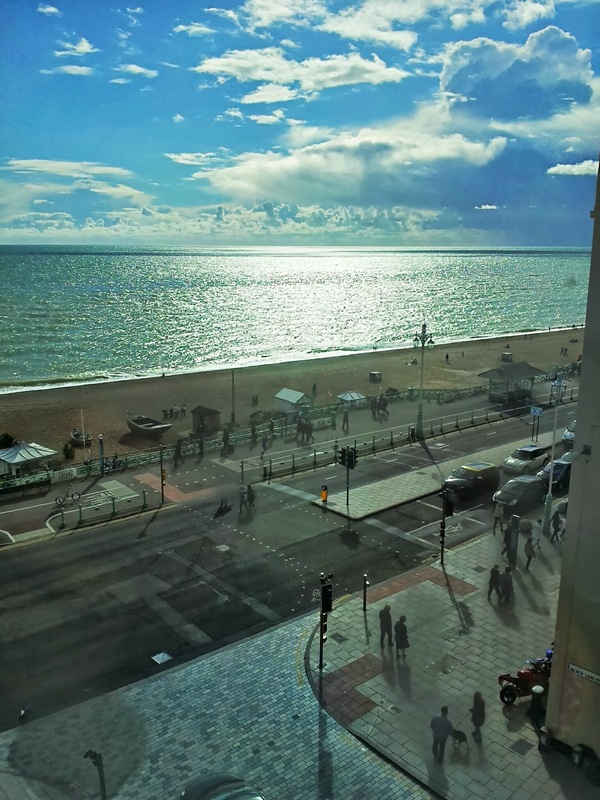 Our stay in Brighton was fantastic and it was so nice to take it easy and relax after the ride, rather than getting bundled in the car to go straight home. The following morning we got up, headed for breakfast and enjoyed a cooked and continental breakfast before heading to the train station. I headed back to London to get my car and my wife headed back home before going to work. 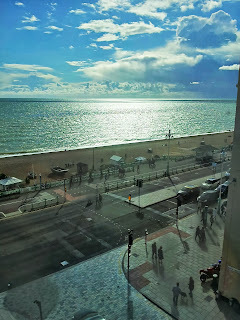 I thoroughly recommend making the most of a city like Brighton and staying there after a big cycle ride.